A new space opera story from an author with a strong legacy in SF is a nice treat. Powell’s work on Ack-Ack Macaque has always intrigued me, but never enough to go out and read it. Whereas this, a more conventionally presented science fiction novel with comparisons to Ann Leckie and Iain M. Banks emblazoned on the cover, seemed more appealing. Embers of War is a good, lean, first person science fiction story that makes use of all of its component parts. The prologue, describing a decisive, if morally questionable action to end a devastating war sets up the plot of the novel which explores the aftermath of this moment and its effect on a selection of key individuals: Sal Konstanz as captain of the Carnivore class space ship, Trouble Dog is seeking personal atonement for her actions in the war, Ona Sudak has a hidden past, that is gradually revealed through the story, Ashton Childe wants out of his current commission and when offered a new mission, jumps at the chance and, finally, Trouble Dog was part of that morally questionable action and is also seeking some kind of new purpose in being a search and rescue ship. The quote from Paul Cornell on the back cover of the book comparing Embers of War to the writing of Leckie and Powell is a high bar to live up to. In some ways it is accurate. Powell makes use of sentient ships and manufactured intelligences that compare to these authors. However, Powell is different. His instincts are towards action and short, bullet chapters. The exposition and scene setting of Banks is not here, neither is the detailed character study of Leckie. Readers who might expect the depth of these contemporaries, will not find this in Embers of War. Additionally, owing to the punchy structure, Powell’s worldbuilding echoes the ideas of others, but never convinces the reader of its depth or makes us care about these sides, beyond the narrative moment that set up the story. The only exception to this, is his use of Nod, the ship’s engineer, who is under-realised in the story. The theme of redemption is crucial to several character paths in Embers of War and is perhaps overly emphasised. When characters with baggage meet other characters with baggage, maintaining their different perspectives and personalities can be hard. Powell manages this by juggling his supporting cast carefully, although some of them are clearly more interesting than the perspective characters. The strongest scenes of the book lie in its moments of action. Trouble Dog’s battles against her enemies are cleverly described with a blend of virtual reality communications and first-person narration of space warfare. This never gets bogged down in detail and never telegraphs its outcome. The resolution of the book, utilising a cross between two popular plot tropes, the big dumb object and chekov’s gun is a little too convenient and again, Powell’s worldbuilding is thrown off by his sense of scale. There is a David Eddings’ like moment that undermines some of the clever ideas and uses of space. The partial knowledge of narrators meant that this could have been handled subtly, but it isn’t, and the epic scale being projected does not hold quite enough weight to convince. 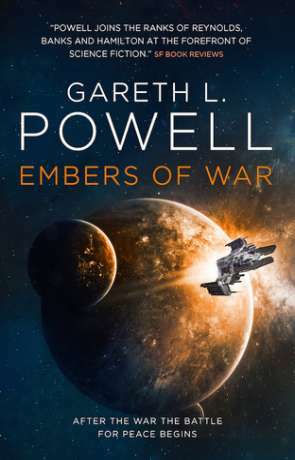 Embers of War is a possible starting point for other novels from Powell set in the same fictional canon and there is certainly enough here to warrant more. Fans looking for a punchy, action-oriented story will definitely get that. Written on 26th May 2018 by Allen Stroud.